Before bringing the suggestion of a domestic violence program to management, survey the landscape for overall interest and individual supporters. Approaching management as a group will increase your chances of success, so try to find a few other people who will stand as allies. Perhaps it’s a corporate security leader who frequently mentions the issue of domestic violence when discussing risks to the company, or a human resources professional who sits on the board of the local domestic violence shelter. Any one of these people could be enlisted to help back your cause, along with legal, accounting, insurance, EAP, or payroll personnel who can help explain the benefits to senior level staff. The point is to approach management as a team of committed individuals who are willing to get the ball rolling, as opposed to just one person with an idea. This cadre will ideally be led by an upper management champion who supports and represents the voices of the group. In addition to individuals, backing can be sought from the workforce as a whole. Consider inviting a presenter from a local domestic violence agency to come do a “brown bag” informational session at your workplace. Afterward, attendees can fill out a survey indicating their interest in a company-wide domestic violence program, and to what extent they would want to be involved. Lastly, you will want to build relationships with local domestic violence organizations and police departments. These groups can be great allies and resources, but it is important to develop connections before assistance is needed. Do so through activities like participating in a fundraising event for your town’s shelter, sponsoring a domestic violence conference, or attending police led community safety meetings. The nucleus of any quality domestic violence program is a focused multidisciplinary team to oversee the process of creating, launching and operating it. In some companies, this might be a domestic violence task force to which senior leadership assigns representatives from stakeholder departments. In others, the domestic violence committee may come from (or be incorporated into) a pre-existing threat assessment or employee wellness team. Who should have a seat at the table when it comes to addressing domestic violence? Any department that directly deals with the issue, such as security, human resources, legal, communications, employee assistance programs and union representatives. If possible, subject matter experts should be brought on as consultants throughout the construction process and retained to advise the team on particularly challenging cases. The training of the domestic violence team can be expanded to include threat assessment and management skills, so they can better evaluate and respond to concerns that arise. A simple protocol should be developed to determine how cases will arrive at the table, how team members will be convened to address them, and how threats will be reviewed and dealt with. Team members can also be taught to create customized workplace safety plans and help employees navigate the variety of accommodations and services offered. Part of the team’s goal is to increase the safety of the work environment by determining what the emergency response protocol will be. Security is at the core of the team, advising members on how to best respond to crises such as an active shooter scenario. The objective is to formulate a plan that lets everyone, from upper management to front line staff, know exactly what to do when faced with an act of on-site violence. The next step in your efforts is to clearly define the company’s stance on domestic violence through a comprehensive employee conduct policy. In many states, public organizations are required by law to do so, and a multitude of complicated legal issues exist around subjects like confidentiality and non discrimination. Companies are responsible for making sure their policy is in accordance with the laws of any jurisdiction they function in, a particular challenge to companies that operate in multiple districts, therefore legal counsel will be a crucial part of your policy building process. If you need up-to-date information on legislation regarding domestic violence and the workplace in any state, the Legal Momentum website is a great place to start. Depending on the particulars of your organization, your domestic violence policy may stand alone, or fit well into an existing workplace violence document. One of the multidisciplinary team’s first tasks will be to look at what is currently in place, determine which policies and procedures already cover domestic violence, and decide what changes might be needed. Policies addressing domestic violence should concentrate on the following key areas, conveying expectations and promises to both victims and abusers. In regard to victims, the focus should be on safety, job security and available accommodations. For instance, if an employee is being harassed at work by an abusive partner, their supervisor may be able to change their station, shift or branch location so they are less accessible to the offender. Security may be able to provide parking lot escorts, and a two-way radio to alert both parties to the presence of the abuser. Human resources may be able to assist by allowing the employee time off to deal with the medical, legal and emotional problems that often accompany abuse. An ideal policy would also pledge that victim confidentiality and job status are protected in the event of a discovery or admission about abuse. Victims should know that specifically identified staff members (security, HR, etc.) will be alerted to their situation on a need- to-know basis only, and be assured that their lives will not become water cooler gossip. In regard to perpetrators, the key message should be one of zero tolerance for violence (or threats thereof) on company property, at company functions, or via company resources (phones/computers/vehicles, etc.) Any one of these actions could be grounds for a negligent hiring, retention or supervision lawsuit so it is imperative that employees be well informed of the consequences for violating the rules. At the same time, batterers should be aware that counseling is available through local or employee assistance programs, and have assurance that they won’t be penalized for seeking help on their own volition. The overall goal is to cultivate an environment of open communication that encourages disclosure. When employees know help is available and their job is secure, they will be much more likely to confide in their employer. Without that confidence, they may keep quiet, which puts the employer in the dangerous position of “flying blind”, never knowing the source or timing of a potential attack. The next stage in creating a strong program is to plan and provide specialized training for the multidisciplinary team, human resources, and management personnel around how to identify and react to situations of possible domestic violence. The focus is on skills based, regularly repeated trainings that allow for refreshers and employee turnover. This should be done in advance of any publicity about the program; otherwise, departments may find themselves flooded with questions they cannot answer. Management staff and human resources need not be experts in the subject, and they shouldn’t assume the role of counselor or become personally involved in employee situations. However, they should at least know how to identify a domestic violence situation, how to sensitively approach and respond to victims, and where to send them for further assistance. Professionals often call this type of training the “3Rs” (Recognize, Respond, and Refer). Included should be a brief subject overview that facilitates general awareness of the issue and the company’s policies regarding it. Some departments may need additional training that others do not. For example, the security team will need to know how to enforce protection orders, while the human resources department may need extra information on employment law or victim privacy. Trainings can be held in person or through an online module, and include line employees as well as management, so they can serve as a resource for their co-workers. After all, studies show that victims of violence are more likely to turn to their co-workers for help than their boss, reflecting legitimate concerns about confidentiality and job status. Once your program is ready to launch, it’s time to crank up the communications. Employees can be informed about the new effort through memos, company websites and email, electronic or paper newsletters, break room posters and brochures, or payroll inserts. While the message on a poster, for example, should be brief, employers can use the company website or employee handbook to disseminate a wealth of information about domestic violence. They can also speak about it at orientation, in-service and wellness trainings, as well as arrange quarterly seminars featuring speakers on domestic violence. Campaign messages should stress several key points including the idea that domestic violence in the workplace affects everyone. Employees should be taught to recognize signs of abusive behavior in a partner or signals of victimization in co-workers. Lastly, they need to know specifically where to turn for help, understanding that they will not get in trouble for disclosing that they are a victim of abuse or for expressing concerns about a fellow employee. A simple referral to the EAP, or a local domestic violence hotline will suffice. 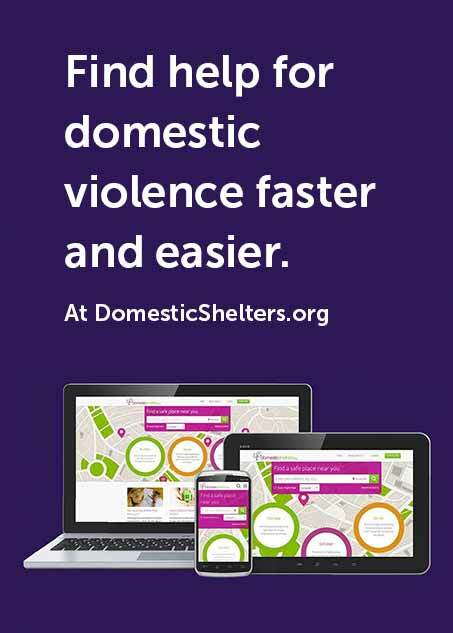 Now that you’ve got a domestic violence program you can be proud of, it’s time to let the media, your community, your customers, your shareholders, your industry peers, and other groups know what you’ve created. Sharing cases and ideas with other employers is a great way to build strategies and connections while gaining wisdom from each other’s experiences. Employers who have already been successful in creating their own programs may offer advice through coalitions such as the Corporate Alliance to End Partner Violence and Workplaces Respond to Domestic and Sexual Violence. Other ways to take a stand against domestic violence include offering employees the opportunity to volunteer with or collect donations for a local battered women’s shelter, partnering with service providers at an employee health and wellness fair, or sponsoring a domestic violence conference or fundraiser. Addressing domestic violence in the workplace isn’t an overnight task, but it is an incredibly important one, the impact of which will make your company and your community stronger and safer for everyone. Please consider what your organization can do to fight domestic violence today, and move forward with courage. Editor's Note: Lynn Fairweather, MSW, is an abuse survivor who has worked in the domestic violence response and prevention field for over 23 years. As principal of Presage Consulting and Training, she provides professionals with domestic violence threat assessment and management training, workplace violence program and policy consultations, and 24/7 individual case response. Lynn is the President of Oregon VAWPAC, America’s only political action committee focused on violence against women, and is author of Stop Signs: Recognizing, Avoiding and Escaping Abusive Relationships. Should Guns Be Allowed in the Workplace?